That’s right! 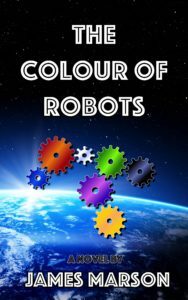 My first novel, The Colour of Robots, is here. It’s science fiction, as defined by the fact it’s got space, spaceships and robots in it. But also an all-female pirate crew and some scientists. It’s even funny in places. If you subscribe to Amazon, you can even read it for free. So why wouldn’t you? After all you love science fiction and you’re always happy to be amused right? Sci-fi adventure: It is a hundred years since the War with the Robots and the universe is now a much safer place thanks to the Empire’s ‘Anti-Robot’ directive outlawing anything with more artificial intelligence than that required to operate a dustpan. Therefore it comes as a complete surprise to haphazard junior planetary engineer Karl Dougan when he discovers two fully-functioning, supposedly long-extinct robots on a remote planet. Sadly for Dougan, he’s the only one who knows anything about it and, lacking the courage to tell anyone else, he sets out to quietly fix things himself. This takes him on an adventure involving the fleet of the Imperial Navy, space pirates, a determined journalist who doesn’t rate him very highly, a rogue battle computer, and a homicidal, slightly farty, pet cat. So there you go, now you’re fully equipped. Head on over. check out the reviews and join us on the journey.